An artful combination of beautiful greens makes up this gorgeous corduroy skirt! This skirt also comes with spacious pockets – one with a zipper, the other buttoned. 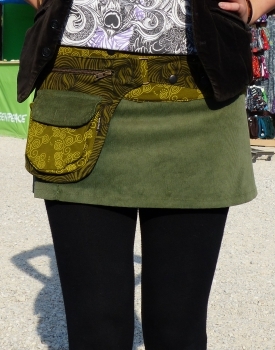 The three green tones (olive, grey-green and light green) complement each other perfectly, as do the three patterns - corduroy for the skirt, swirl and floral print for the pockets and waist. The skirt comes in one size but is easily adjusted to fit any shape thanks to a row of closely placed snap-fasteners, allowing you to choose the fit most comfortable for you! - Nickel-free oxidized brass fasteners, Made in Germany!